I love banana splits, but I rarely order them when going out for an ice cream treat. Making a banana split at home is another story. I usually have the fixings. Bananas in my fruit bowl – check. Ice cream in the freezer – check, check, and triple check. Chocolate chips, marshmallows, and syrup in the pantry? You bet! Yummy! Let’s start fixing a banana split. Unfortunately, when my doctor suggested I cut back on sugar and lose weight to lower my blood sugar levels, most of the sweet treats I love I’m no longer eating. Fear is a great motivator to lose weight. That doesn’t I don’t have sweet treats hanging around. My freezer has lots of cookies and chocolates waiting for me to enjoy a snack. Talk about willpower. I’m pretty determined to cut back the junk and eat more healthy foods. 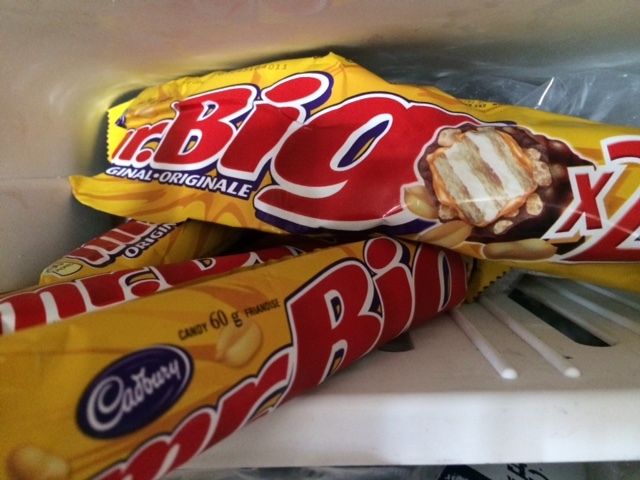 Who can forget the Mr. Bigs I have in my fridge’s freezer compartment? This is one of my favorite chocolate bars, and a very generous former co-worker picked them up for me from time to time. Months later, six Mr. Big chocolate bars and two double pack Mr. Big bars are untouched in the freezer. I could easily eat at least one a day. Be healthy! Choose healthy snacks! 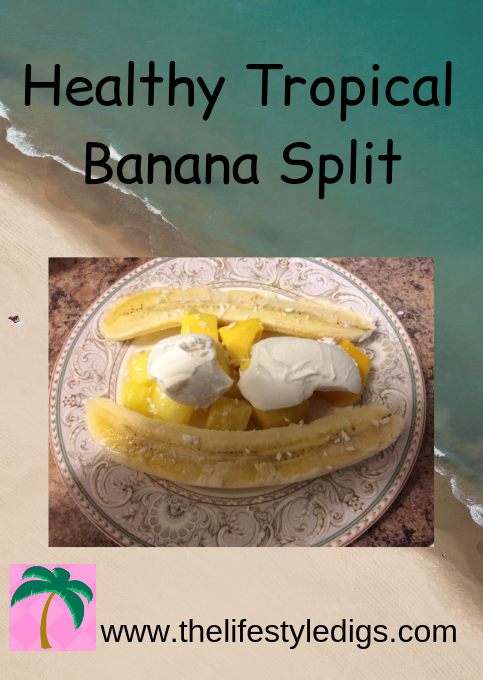 Today I’m sharing my healthy tropical banana split. With only five ingredients, it’s a snap to put together. Well, six ingredients if you include the seasoning, but that’s optional. I keep fresh bananas in the house, but being a single too many times when I buy fresh fruit, it goes bad before I eat it. If my bananas are starting to get too ripe, I freeze them and enjoy them in my chocolate peanut butter banana smoothie. I buy fresh fruit with a longer lifespan like apples and pear, but generally I buy frozen fruit. Right now my freezer holds raspberries, blueberries, sliced strawberries, pineapple, mango, mixed berries, and cherries. I bought some frozen cranberries not too long ago, and I’ll be creating a smoothie with them one of these days! 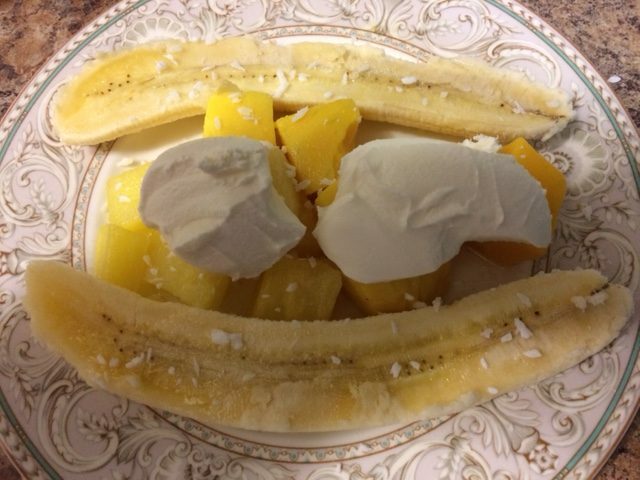 When I’m craving a healthy tropical banana split, I have to plan at least an hour ahead for the mango and pineapple to thaw. I put about 6 or 7 chunks of each onto a plate, and then I make dinner or watch TV until I’m ready to make my dessert. The more I think about it, the healthy tropical banana split could also make a great breakfast. When the fruit is thawed, I slice a banana in half and arrange it around the mango and pineapple chunks. I found a spice on Amazon that I like called Orange Ginger and I sprinkle it mainly over the bananas. If the spice lands on the other fruit, that’s OK too, but I go light on this spice. Now, I don’t recommend you buy this spice from Amazon because the current price of $17.60 is a rip off. I’m only showing this so you get the gist of what I’m doing to jazz up my healthy tropical banana split. If you can buy this spice cheaper somewhere else – yay! Leave a comment and tell us where. I purchased the product from Amazon Canada as part of a variety pack. A little pricey at $35, but not bad for what you get if you like to consider them sort of gourmet spices. The orange ginger was the one seasoning I didn’t think I’d like. What a pleasant surprise it goes perfectly with the healthy tropical banana split. For my U.S. readers, when you take in account the exchange rate, this variety pack is a good deal. OK, let’s get back on track and finish off this banana split! I add a couple of spoonfuls of vanilla Greek yogurt, because I usually have on hand to top off my chocolate chip peanut butter oatmeal bake. You can use any yogurt you keep in the fridge. Then I sprinkle some coconut over top, and it’s ready to eat! I hope you enjoy it. I especially hope you enjoy it for breakfast one day. Please tell me I’m not the only one out there who’d like to eat ice cream for breakfast! The healthy tropical banana split is the less guilty option.